Danny—a forgotten, former student of his—has committed suicide, and in the letter he left behind, he requested that Coach speak at his funeral. With Coach’s commencement speech at Thompson High School graduation just days away, and dealing with fresh insecurities from his pending life-change, the bad news couldn’t have come at a more inopportune moment. After Danny’s funeral, Coach reflects on his own life and, over the next week, he encounters six people that will help him discover his second day…and the reason he was put on this earth. 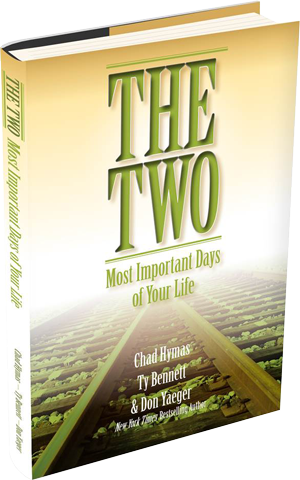 The Two Most Important Days of Your Life takes readers on an inspiring and emotional journey that will help chart the path to finding one’s true purpose, defining moments, service opportunities, passion, value, and worth. Everyone struggles with purpose. Every person, team, or organization seeks relevance in the people they serve and the questions they ask. We all have been fortunate enough to have been born, but not all of us take the time to really consider why. Drawing upon their collective vision and creativity, authors and speakers Ty Bennett, Chad Hymas, and Don Yaeger have infused this engaging story with practical lessons of hope, change, and empowerment. For thought-leaders, innovators, managers, athletes, and teachers and students of all ages and kinds, The Two Most Important Days of Your Life provides a compelling, powerful road-map to answer the toughest questions of life in order to bring out the absolute best in yourself and your team. After reading this book, you will be forever changed.